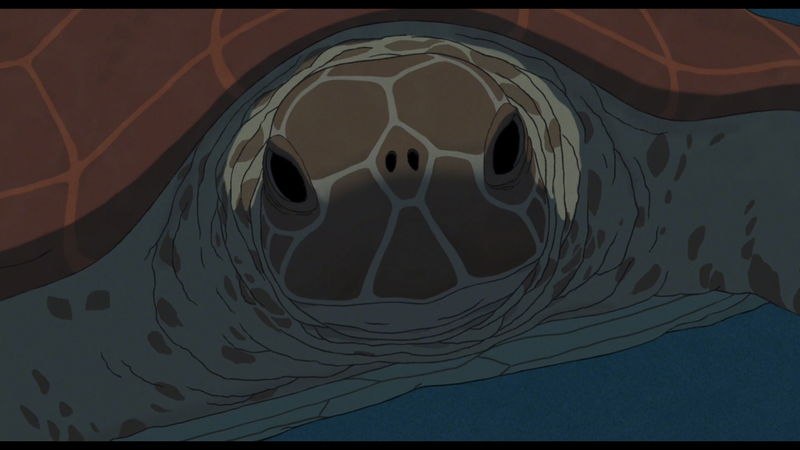 I am the red turtle. I am watching you. I have come to the conclusion that my little darling 8-year-old son is a xenophobe. He begrudges his French lessons in school. He noisily demands that the European/African/Asian children in his class “Speak ENGLISH!” and he gets irritated when I’m watching subtitled anime on television and I tell him there’s no dub option. In his mind, English must be the default language of the world, everybody else just speaks wrong. Last week he survived a viewing of the unfortunately English-subtitled-only Princess Arete, my review mentions this here. I thought I’d make up for this terrible mistake by treating him to a movie with no dialogue whatsoever. Hence we watched together the oscar-nominated Studio Ghibli/Why Not Productions/Wild bunch 2016 co-production The Red Turtle. My fickle son preferred Princess Arete. Oh well. Anyway, this is a mostly European production with only a couple of prominent Ghibli alumni credited with direct involvement - Toshio Suzuki and the late Isao Takahata as producers. The overall aesthetic certainly does not betray any anime influence, taking more notes (certainly as character design is concerned) from the Belgian artist Herge and his “ligne clair” (clear line) approach. Instead of big anime-style eyes, the characters have mere dots - though that does not make their faces any less expressive. All alone. Those pristine white clothes won’t remain untattered for long. Dialogue-less does not necessarily mean silent, our main character shouts out the odd “Hey!” or grunt of frustration. The viewer gleans most information about his intentions and mental state purely from his actions and wonderfully animated body language. Character movement is expressive and easy to follow and on the whole my son understood mostly what was going on. I do not think this is a film primarily aimed at children, however. Somehow this film without oral communication between its characters manages to explore deep themes like loneliness, belonging, frustration, regret, coming of age plus romantic and familial love. Some of that required some careful explanation to my small one. If you like existential, wordless screaming, this is the movie for you. The story is simple - a shipwrecked man finds himself washed ashore on a remote island with no immediate hope of rescue and he must use the resources at hand to first survive and then attempt to escape. I do admit I initially felt some anxiety for his plight, I worried this might be one of those films where every tiny little bit of progress is hard-worn through painful trials, horrific injury and disease from dirty water/animal bites/accidental injury. Thankfully the story is not so cruel - in that regard. Unfortunately his hard work at assembling rafts of ever-increasing size and sturdiness is literally shattered by an apparently malevolent giant red turtle. The turtle seems to bear no ill will against the man directly - only his rickety rafts - so each time he returns, despondent, back to shore to try again. Our man seems pretty adept at survival - he finds fresh water without too much hassle, plucks fruit and hunts fish for food. He even skins a dead seal to make new clothes for himself. Although none of this work is dwelt on in great detail, it does add a certain grounding to what becomes a more fantastical story later on. Initially the fantasy is restricted to some odd dream sequences - at night-time he imagines himself flying across a bridge to escape the island, then as he becomes more despondent he starts to hallucinate a string quartet on the beach during the day. Only after he attempts to take revenge on the red turtle as it crawls ashore - flipping it over onto its back to be baked in the sun - does the story itself take a turn for the slightly more surreal. I found the following scenes where he feels increasingly guilty for what he has done to the majestic animal to be quite affecting. Long sections of the film are completely silent, and at these times my son’s attention wandered, though I was on the whole captured by the smooth animation and the muted colours. Night-time and dream sequences tended to be depicted in striking monochrome. The sparse score is beautiful and melancholy and greatly enhances those scenes of emotional devastation. I found my eyes a little moist by the conclusion. “That was very sad,” said my son (otherwise unaffected) as I wiped my eyes. Turtle stares menacingly at man. A timeless love story. I’d recommend The Red Turtle to those who don’t mind their entertainment to be quite slow (even at a short 80 minutes runtime) and somewhat obtuse. Although it may at first glance appear to be something of a shallow experience, look deeper and you’ll see it has hidden, melancholy depths worth exploring at least once.